Estella instruments provide the best value for music enthusiastic to start pursuing their performing experience. These instruments are designed and collaborated among a group of industrial experts and manufactured to international standard. This series of products used to be exclusive and now open to the public for the first time. All the products will be examined by specialists before delivery. We assure the best quality for you. Solid spruce top, solid maple back and sides, ebony fingerboard, inlaid purfling, jujube black dyed pegs and chin rest, jujube black dyed tailpiece with 4 nickel plated fine tuners. Maple neck, back and sides to foster the stability of parts and provides great acoustical quality and well response. 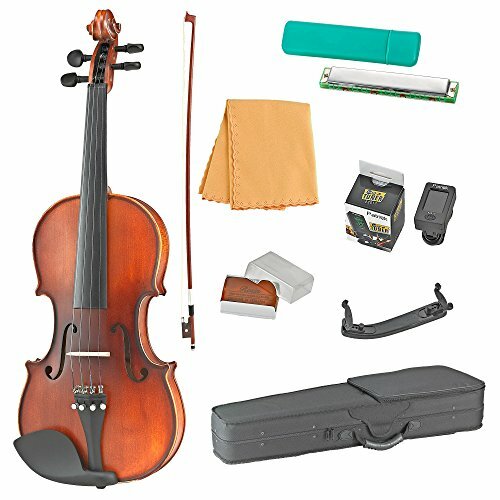 Includes: light weight case, adjustable shoulder rest, tuner, entry model bow, quality rosin, soft cleaning cloth, and quality harmonica. Perfect for beginners or student violinists.